Ambitious plans to turn parts of east London into the "Venice of the east" are to be revealed. 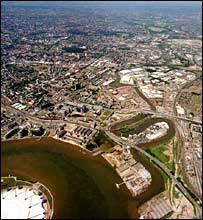 The Water City scheme hopes to open up derelict waterways from areas like Canary Wharf to the Royal Docks and from Greenwich to Hackney Marshes. The River Lea and Regent's Canal would also become the main arteries of about 250 hectares of new green space. The 2012 London Olympics will begin the redevelopment but officials want to expand the benefits across the area. Last week the mayor announced plans to redevelop the Lower Lea Valley area, where the Olympic Village will be sited. Over the next decade, the scheme will bring up to 40,000 new homes and 50,000 jobs to one of the most neglected regions in the UK. Between 30,000 and 40,000 houses, 40% of them for families, would be built on 173 hectares of what is now industrial wasteland. There would also be up to nine new primary schools and four more secondary schools. A new road will connect the five town centres planned in Stratford, Canning Town, West Ham, Hackney Wick and Bromley by Bow. Most of the 50,000 new jobs in the area would be based in Stratford City, a huge new shopping mall and office complex. Andrew Mawson, one of the leaders of the Water City initiative, said: "Our vision is to capture the entrepreneurial energy of east London's remarkable communities and enable them to co-create Water City with the world's finest architects, designers and economists and, in the process, transform the economic opportunities and life chances of east Londoners forever." The Rt Hon Tessa Jowell MP, Secretary of State for Culture, Media and Sport said: "It's encouraging to see there is active debate about how we can shape the Lower Lea Valley."